The PDCA Cycle is a framework for problem solving, continuous improvement and change. It is widely recognized as the basis of continually improving the quality of processes, products, and services. It is an easy to remember four logical sequence steps: Plan, Do, Check and Act. It provides a simple and structured approach for solving quality-related problems. Multiple iterations of the PDCA cycle may be necessary to solve the problem permanently and reach the ultimate goal state. The PDCA cycle is particularly effective when intending to make minor changes to a process and when the solution to the problem is known. It allows to verify the feasibility of a proposed idea whether it is an incremental or a breakthrough improvement. 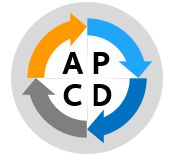 Repeating the PDCA cycle frequently will help implementing Kaizen and other continuous improvement initiatives. Additionally, TQM, the ISO standards and the A3 thinking process are all based around the PDCA philosophy. Using the PDCA cycle encourages the methodical way of problem solving and implementing solutions. It ensures that you plan, test and incorporate feedback before you start full-scale implementation. This brings you closer to your goals as knowledge is increased from solving problems, from failures, and from the feedback received. It also improves the critical thinking skills of your team and helps your organization to reach towards a more integrated system. The PDCA cycle begins with a Planning phase where the problem and objectives are clearly identified. In Planning, the team selects the problem to be solved (or the process to be improved) to deliver results in accordance with the expected objectives. In Planning, you analyze the current situation, identify solution alternatives, and select and schedule the most promising solution (or solutions). The solution is then tested on a small scale basis in the Do phase. Do involves implementing the solution on a small scale, collecting data for later analysis, and measuring progress. Do ensures the solution is appropriately tested and benefits are validated before committing to full implementation. Check involves analyzing the collected data and comparing the actual results against the planned objectives. It allows evaluating how well the solution worked and discussing whether further improvements are possible. It is also concerned with identifying the unexpected issues, their causes, and gathering and summarizing the key learnings. Note that you may need to repeat the Do and Check a number of times until you get the optimum results. A plan should be created for the full implementation after evaluating the costs and benefits for each alternative. Act involves acting on the feedback and lessons learned and implementing the solution fully. Act is also concerned with standardizing, documenting, sustaining the improved process, and integrating it into the organization’s system. The use of the PDCA cycle doesn’t necessarily stop here. Once the Act phase has been completed, you may identify the next improvement target and start again at the plan phase. The PDCA cycle can be repeatedly applied in a process of continuous improvement where there is no end to it. Each cycle will bring you closer to your goals and will extend your knowledge further. Data should be collected continuously to measure and evaluate the performance on a continual basis. The PDCA cycle can be used in many different situations. For example, when planning to change the supplier of a product or service, or when trying to implement a new safety program within a facility. 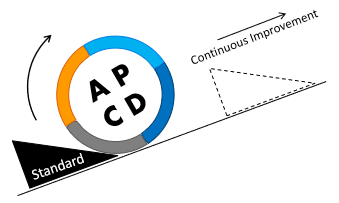 A common example often used to illustrate the PDCA cycle is when a design team is planning for a new product development. The PDCA cycle is often referred to as the “Shewhart Cycle” or “Deming Wheel” as it is defined by Shewhart and modified by Deming. (Shewhart and Deming are recognized as pioneers in the quality management movement). In 1990, Deming introduced the PDSA cycle (a modified version of the PDCA cycle). He believed that data analysis is an essential part of any improvement effort, and checking does not necessary imply an in-depth study.